Studying a disease like Usher syndrome has required me to become intimately familiar with the inner workings of the sensory systems involved. The days I don't spend actually discovering new things about eyes and ears in my own lab are spent reading everything I can get my hands on about what other people know about them. Some people (*cough* Mark *cough*) might consider this reading of dry scientific papers an onerous task, but I actually love it. While most of the science I've discussed on this blog so far has been fairly clinically oriented I think there's some value in spending some time getting back to the basics of the system. I was faffing about on YouTube recently and rediscovered a very cool little video that seemed appropriate to share on this blog. The video is very short, but I feel compelled to burn up a few more minutes of your time to give a little background and explain what it is and why it's cool-at least in my humble opinion. 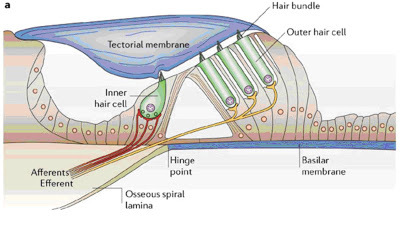 Note that there are two different types of hair cells present here: A representative inner hair cell on the left, shaped like a teardrop, and the outer hair cells on the right, shaped like cylinders. As you may recall from earlier discussions of inner ear anatomy, the tips of all mechanosensory hair cells, both inner and outer, feature specialized structures called stereocilia. A number of stereocilia stick up from each of these cells like stiff little bristles protruding into the hollow, air-filled part of the cochlea and are collectively known as the hair bundle. Hair bundles are the 'receivers' of the cell, responsible for intercepting sound waves in the environment and converting them into electrical energy. In Usher syndrome patients, the organization of the hair bundles is perturbed, so the cell's ability to receive sound signals is impaired. On the plus side, the fact that the hearing problems in Usher syndrome stem from defects in the 'receivers' (a.k.a. 'sensorineural deafness') is the reason that cochlear implants can successfully substitute in this capacity. At the other end of the hair cell there are synapses, which are responsible for converting the electrical message into a chemical message that adjacent nerves (stringy yellow or red lines in the figure above) can receive and relay to the brain. In addition to both of these signal processing regions, outer hair cells, the ones that resemble cylinders on the right side of the above figure, exhibit the unique property of electromotility in which the electrical signal is converted into a mechanical signal, such that the sides of these cells can actually shorten or lengthen in response to sound. Functionally, the electromotility of the outer hair cells provides improved auditory acuity, enabling the outer hair cells to discern subtle differences in frequencies. The complex and nuanced physiology of the inner ear is a marvel to behold, and as wonderful and life changing as cochlear implants have been for Usher patients, specializations like electromotile hair cells demonstrated that our technology is still quite limited in its ability to emulate the intricacies of our sensory systems. Whoops, I promised you a movie, didn't I? Ok, here it is. When you push 'play', at long last, you'll see a recording of a cultured outer hair cell taken from a mammalian cochlea. The sound to which the cell is responding is being played through a thin glass pipette, which you can see, faintly, in the frame, and the electromotility response should be pretty apparent. Enjoy.